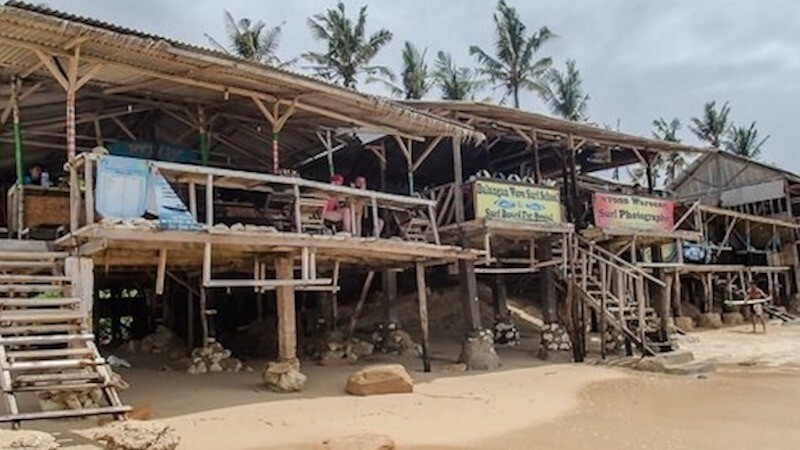 It’s really difficult to tell what the best Bali beach is, but most people agree that Balangan Beach is a unique, fun and beautiful foreshore that deserves everyone’s attention. Pantai Balangan is situated in Peactu, Jimbaran, about twenty minutes south of the famous town of Kuta. This makes it one of the southernmost seaside on this island. For many people, this is one of the best secluded shoreline in Bali that has not yet been fully commercialized. This is what gives this place a special significance. 1.1 Special Quite and Surfing Beach. One of the things that make Balangan Beach Bali unique is the fact that the shoreline is covered by a cliff that makes it invisible for those that have never been there. Only when a person reaches the top of this cliff, they will be able to notice the foreshore and the high waves created by the magnificent Indian Ocean. All in all, Balangan Beach is one of the best beaches in Bali not only for surfers but for every person who enjoys sandy foreshores. The Beach Balangan can’t be accessed by car directly and you will have to walk a little bit to reach it. The stone stairs make this trip more adventurous and memorable. The good news is that there are still not many tourists that have found this location which means that if you don’t like crowds, this may be the perfect option for you. Although this Jimbaran area is a relatively quiet and relaxed, this doesn’t mean that you can do anything else but sunbathing there. For starters, many experienced and enthusiastic surfers are visiting Balangan Bali on a daily basis. There are some big waves and swells here throughout the year. The size of the waves and swells make it suitable for intermediate and experienced surfers. Beginners should probably look for another place where there are not as many rocks as here. Taking photos is another activity that you can do while you are here because there are some unusual, attractive vistas that you don’t want to miss. Special Quite and Surfing Beach. Pantai Balangan it's a small paradise located in Pecatu. White sand, umbrellas, cheap warungs, surfer bars and more. If you visit Bali make a stop on this foreshore. Mirage-like left spinner that is often a sectiony close-out, depending on swell direction and tide height. On this shoreline you can have a clean conditions and great waves. 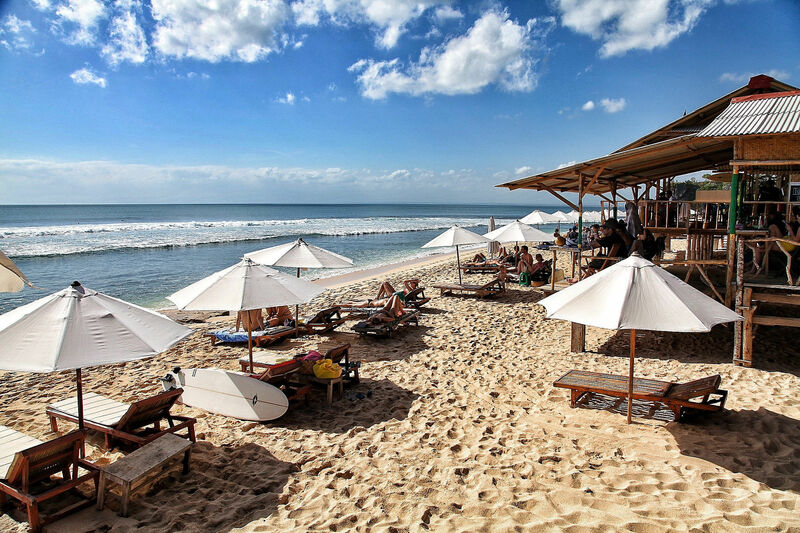 Similar to most parts of Bali Island, Balangan Beach Weather can be described as tropical. In other words, there are some dry as well as some wet periods that last for months. The temperature is more or less the same all year long. The best months for surfing activities are between April and August. This is the dry season and even though some shows are possible, the pro surfers won’t have any problems with that. The water is relatively warm throughout the year. As one of the most developed parts of Bali Island, at least when it comes to tourism, Balangan Hotel has a wide array of accommodation solutions for its visitors. Many of these accommodation options have 5 stars and can be quite costly, but you can find good accommodation without breaking the bank too. The good thing is that many of these hotels, bungalows, and lodges are located very close to the Beach Balangan. Some examples include Santai Warung Bali, The Point Beach Front, Balangan Paradise Hostel and White Palm Hotel Bali. The price of rooms is reasonable and depends on the time of the year when you want to visit this place. Obviously, the prices are higher during the holiday season. We have already mentioned that Balangan Beach is one of the southernmost shoreline on the Island of the gods close to Dreamland. It’s located in the very south of the island. You can easily take a boat from Kuta and go there. In fact, there are boats that come and go there all day long. This is also one of the most affordable ways to get there. The other options you have are by car and by bus. If you are driving there, the best option is to follow Jl. Raya Uluwatu Pecatu road and take a right turn to Jl, Pantai Balanga road. This road will take you straight to the foreshore. The international airport is just 50 minutes away.